Japanese seaweed crackers are delicious. You may have had some Japanese snacks without realizing it. Roasted wasabi-coated green peas and spicy cracker mixes are often served during happy hour and are especially consumed with beer in America. Traditional Japanese snacks are usually healthy because many of them are made from red azuki beans, known as bean paste. They also are known for their dried fish, squid, or shrimp, often used to flavor crackers. With the Western influences over the decades, sweeter snacks like chocolate-covered pretzels and butter cookies are now sold in stores. These have much more sugar than snacks of old. Manjyu - Similar to the Chinese moon cake, these delicacies are filled with sweetened red or white bean paste and often have a ginnan (gingko nut) inside. Green tea flavored manjyu are also popular. Ohagi - Pounded sticky rice is formed into a ball and covered in sweet bean paste or soy flour. Dango - Sticky sweetened rice is shaped like a dumpling and covered in soy flour. Three dango are sometimes served together on a wooden skewer. Mizu yokan - This red bean paste gelatin is both sweet and good for you. 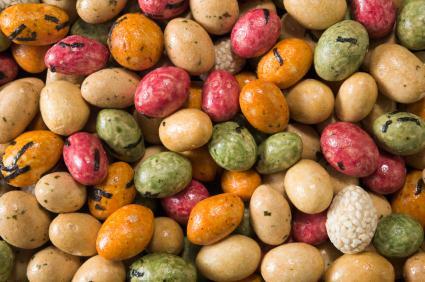 Arare - A spicy cracker, often mixed and served with peanuts. Bonchi - A sweet cracker made of rice. Fried broad beans - These are flavored with either seaweed or wasabi. Wasabi peas - Strong enough to clear any nasal passages. These crunchy green peas covered in Japanese horseradish are an acquired taste. Shrimp peanuts - Shrimp coated with peanuts often have shredded seaweed around them. Shredded and dried squid - This delicacy is sold in packages and served often with beer or sake. Kappa ebisen - These crackers are flavored with tiny slivers of shrimp. Roasted green peas - These mild peas are crunchy. Fish and cheese sticks - Cheese and dried cod are made into a paste and formed into sticks. 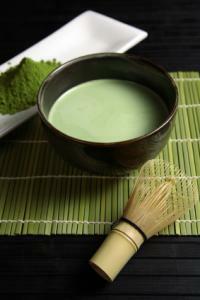 Matcha is used for flavoring snacks. Mizu yokan is a popular treat, often served at tea time. Its main ingredient is agar, also known as kanten, or agar agar, a gelatin substance made of the membranes of red algae or seaweed. Agar agar is a Malaysian word meaning jelly. Wash the agar thoroughly and squeeze out the excess water. Tear the agar into pieces and soak it in 1 2/3 cups of water for 1 hour. Place the agar and water into a pot. Cook under medium heat while stirring occasionally with a wooden spatula. Add the refined bean paste (recipe below) and continue to cook for three more minutes. When the mixture is an even consistency, turn off the heat. Place pot in a shallow tray of cold water. Stir gently as the mixture cools. Put the mixture in a pan or mold that has been moistened with water. Remove mixture from pan and cut with knife into attractive tiny pieces. Place the red beans in a pot, adding plenty of water. Put the beans back in the pot and add more water. Bring to a boil and add 1/2 cup more water. Continue cooking over low heat and add water if necessary. Cook for three hours until the beans are soft. Continue to cook over low heat, adding the sugar until it dissolves. Gently stir with a wooden spatula until the beans are tender and glisten. Remove the beans from the pan, place in a colander, and run cold water over them. Place a bowl under the colander to catch the liquid as you mash the beans in the colander. Continue to mash so the colander holds only the shells. The juice that runs from the beans through the colander should be saved in the bowl. Strain the beans one last time, this time using a cheese cloth. The liquid that comes out is the paste you will use for the yokan recipe (above).